Shade is a crucial aspect of landscape design. Without it, enjoying your yard in the heat of summer can be difficult. Adding a structure is a good way to provide relief from the sun that goes beyond planting a shade tree and waiting for it to grow. These are typically the most inexpensive option, though that depends on how elaborate the shade structure is. 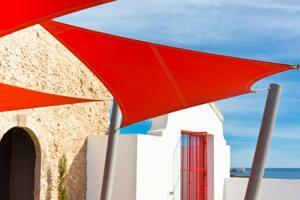 Fabric canopies come in variety of colors and interesting shapes, allowing them to be used with aesthetics in mind, rather than for the purely utilitarian function of sun protection. Some models mount to the outside wall of the house and are retractable when not in use, such as those made by Shade Voilà; they offer custom-built canopies starting at $18 per square foot and pre-fabricated sizes starting around $1200. Shade sails are designed to be strung up with ropes between trees and are typically triangular, such as the 16-foot model available at Global Industries for about $50. If you want shade in a part of the yard where there is nothing to mount to, you can consider a free-standing pop-up canopy, such as the 10 by 10 instant canopy, which retails at Walmart for about $115. The one downside of fabric canopies is their lifespan. Wind and UV rays eventually have their way with them, so it pays to invest in high quality fabric and do your best to maintain it from the beginning. This term refers to wooden (occasionally metal) structures used to create a shady destination in the backyard. Pergolas resemble a large arbor, but are considered destination points, rather than part of an entryway. 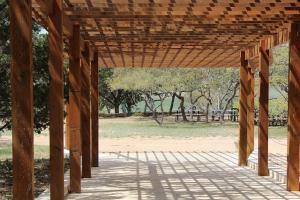 There are many approaches to building a pergola, which provide varying degrees of shade. Often, a vine is trained over a pergola to create shade or you can use the pergola as a support structure for a fabric canopy. Consider one of these kits to create your own. Home Depot offers a 10 by 12 foot pine pergola, pre-stained at the factory and covered by a 10-year warranty for $1200. Lowes carries an aged bronze aluminum 12 by 30 foot pergola for about $5000, assembly not included. For something more unique, take a look at the 12 by 12 foot Cedar pergola on Wayfair.com, which incorporates curved arches for a pleasant design. The downside to pergolas is that they provide only partial shade unless they are outfitted with a piece of fabric or a vine with a dense growth habit is trained over the top. 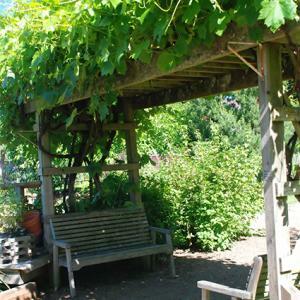 It can take years for a vine to grow to that size, making a successful pergola a long term project. 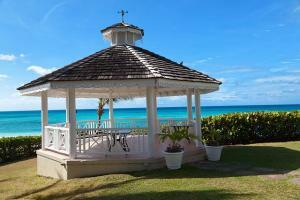 The traditional gazebo is hexagonal or octagonal in shape and differs from a pergola in having a solid roof that blocks both sun and rain, as well as a solid floor elevated off the ground. In addition to the traditional wooden gazebos there are many modern interpretations that vary in shape, materials, and ornamentation. If you're in the market for a traditional wooden gazebo, The Gazebo Depot is a great place to start your search; they offer a variety of traditional gazebos in kit form, including a model with a cupola that starts around $6,000 depending on how you want it customized - i.e., painted or raw wood, pre-wired for electrical fixtures, outfitted with benches, etc. Amazon offers a 10 by 12 steel frame gazebo with a vented metal roof for about $1500. You can order it unassembled or get assembly service for about $540 extra. For a gazebo that's really more like an outdoor room meant to be attached to the exterior wall of the house, Lowes offers a 15 by 8 model with an aluminum roof, screened in windows and sliding doors for around $2500. Besides their substantial price tag, the downside of these more substantial structures is that they generally require a building permit. It's not the end of the world to get one, but it can slow down the process while you wade through the bureaucracy at the local permit office. Cost and style are the top two considerations when choosing an outdoor shade structure, as well as the quality of the materials and expected lifespan. Additional things to consider include your site, installation concerns, and maintenance. Typical locations for a shade structure are in conjunction with an existing deck or patio, next to a pool, or as destination point out in the landscape. A perfectly flat area is needed for any shade structure that stands on the ground, and even for those mounted overhead, you'll want the area to be flat enough to sit on comfortably. If you're incorporating the shade structure into an existing patio or deck area, make your measurements carefully to ensure that the new structure will fit seamlessly with the existing site layout. Every model listed in this article is intended to be assembled by the homeowner, though the skill level needed varies dramatically. Pop-up shade structures are the only choice that requires virtually no mechanical ability at all, though the shade sails are easy to install as long as you're comfortable leaning a ladder against a tree or the side of the house to attach it. At the other end of the spectrum, a wooden gazebo kit requires a significant level of carpentry abilities even though all the wood is pre-cut and detailed installation instructions are provided. A pressure washer filled with a general purpose cleaning solution is the best option to clean most shade structures. The metal versions require the least maintenance, but any fabric surface is bound to get dirty over time and a yearly cleaning is important to keep it in good condition. Wood structures need to be repainted or resealed every few years. Adding a shade structure is a feasible DIY project, though companies that sell the more elaborate kits generally offer installation services if you are not comfortable with the required skill level. You can always call a professional landscape contractor for help, who can design and build a custom shade structure to meet your specific needs.